Another big mistake is over rotating the right foot too far forward. This tends to happen more for players who sing horizontally as the body will rotate much more uncontrollably in a clockwise direction which will pull the foot forward. Bad balance will also tend to pull the right foot to far forward. This makes recovering for the next shot much more difficult as first the bodies momentum needs to be stopped and then the body needs to recover backwards which is much more difficult to do then to recover in a lateral or forward manner. 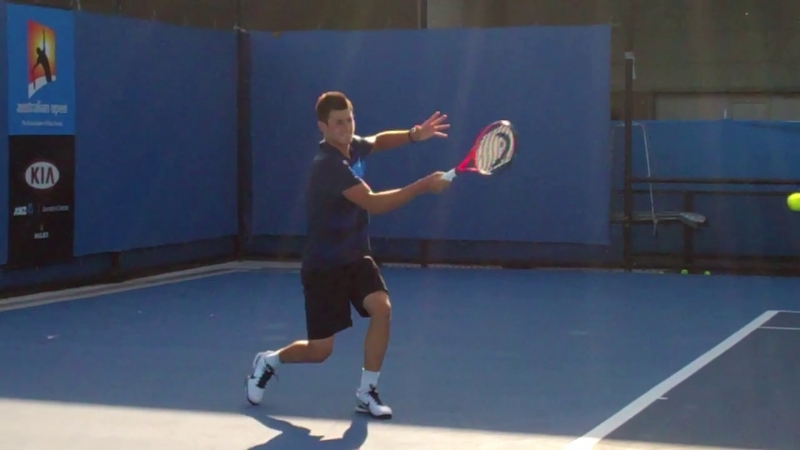 Many players will leave their left arm down at their side as the racquet swings over the left shoulder on the finish. This will tend to tighten up the body which can lead to a much less powerful swing as the body needs to stay relaxed throughout the whole swing. If the body is tensed up at the end it had to start tensing up before then. Since the follow though is a relatively fast motion the tensing up of the body will have most likely started before ball contact. The left arm down at the side makes it impossible to catch the racquet at the end of the swing. This will make the overall finish longer and can make recovering for the next shot take longer. Another big mistake is not bringing the racquet high enough on the follow through. There are two times this is a problem for a player. One is when they are a beginner and they have a tendency to swing horizontally. The second is a more advanced player trying to finish with the racquet on their hip. Head looking up before shoulder hitting chin. Even after the ball is contacted the head should not move to assure that the head does not move before contact. The follow through portion of the follow through happens so fast that there will still be plenty of time to see where the ball is going and what the opponent is doing. Just like the racquet and rest of the body, the head needs to be in the same position it was at the intended contact point.